Your fencing gets all the exposure to the elements which can easily begin to make it look worn down over time. This will impact the look and, over time, the performance as well. If the contaminants building up on your fence are left there and you neglect to invest in proper fence cleaning in Cape Cod, it will eventually begin to break down the material. This is an especially big problem for wood fences that have been left untreated or are in need of re-staining. The good news is that you have found the right team of experts to get the job done. Here at A to Z Softwash we can provide you with the expert service that you need in order to restore and revitalize the look of your fence. This single service can be the difference between being able to keep your current wood fence or having to opt for replacement. Enhance the look, performance and longevity by letting our team take care of fence cleaning for you. When you see the final results, you will be glad that you did. The common mistake homeowners make is to think this is something that they can take care of on their own. The truth of the matter is you can end up damaging your fence, especially if you have a wood fence. On the other hand, you could also end up not getting it clean enough, which defeats the purpose of the entire process. When it comes to this type of wood restoration and exterior cleaning, it is best to leave the job to the professionals. Remove the unsightly and potentially harmful presence of contaminants like mildew, mold and algae. The last thing that you need is for your fence to begin to breakdown just because you failed to schedule a cleaning. Remove stains from your surfaces. For wood or other materials these stains, often formed by exposure to the elements, make your fence look aged and in shoddy condition. A new fence can even begin to look terrible after just one harsh rainy or snowy season. If you are planning on painting or staining your fence any time soon, this is a task you must take care of. This will remove flakes of old paint, dust, rust, mud or other unwanted debris. A to Z Softwash is ready, willing and more than capable of providing you with the quality service that you deserve. We look forward to working with you so that you get the level of expert clean you should be able to expect from an experienced Cape Cod roof cleaning and pressure washing company. As industry experts, we pride ourselves on leaving the very best results. 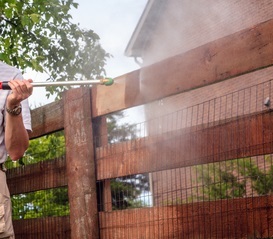 Even your fence cleaning should be superior so give us a call to find out more. If you would like an estimate for fence cleaning in Cape Cod, please call 508-209-7795 or complete our online request form.